Presentation of benefits for "groups"
Bookings for 20 people or more. 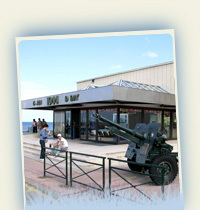 A guided tour (English, French or German) in 5 parts: working model gallery overlooking the historic site, diorama, exhibits, film featuring archive footage and souvenir shop. In order to visit our Museum in the very best conditions, we strongly recommend that you plan your visit several weeks in advance.